How to choose best electric pool heater? If you want to extend your swimming into the cold season, you will need a pool heater that will add some warmth to your pool water. Bearing in mind that during the cold winter there is little or even no sunshine at all, a good alternative to solar pool heating is an electric pool heater. As the name suggests, these are pool heating systems that are powered solely by electricity. Why Choose Electric Pool Heaters? Even though electric pool heaters may shoot your energy bills, they are very reliable compared to solar pool heaters that may fail to warm your pool water when there is a scarcity of sunshine. These heaters also warm pool water quite faster than other types of pool heaters. 2 Why Choose Electric Pool Heaters? In the current market, there are several electric pool heaters from different companies. Each of these pool heaters has different features and prices. This may make shopping quite a hassle, especially for first-time buyers. With this in mind, we have decided to make things simple by compiling a review of the best, reliable and efficient electric pool heaters in the market. The EcoSmart ECO 18 is a revolutionary electric pool heater that is designed in a fresh tankless design with Self-Modulating Technology. It is very easy to use and has been optimized to be highly energy efficient. Here is a review of the EcoSmart ECO 18 Electric Tankless Water Heater. Contrary to what we’d expect, this pool heater sports a simple, compact and lightweight design. It measures 20 X 20 X 6.5 inches and weighs only 14 pounds. Like earlier mentioned, it is tankless. This makes it easy for it to be installed almost anywhere making it ideal for those working in minimal space. On average, it saves up to 12 cubic feet when compared to similar heaters in its range. When it comes to operation, this electric pool heater has been engineered to offer an unrivaled user experience. First, it has digital temperature control for easy temperature setting. The 1-degree increments, on the other hand, ensures accuracy when setting the temperature. This pool heater from EcoSmart has been optimized for energy efficiency. According to the manufacturer’s website, the tankless heater has been proven to cut energy costs by up to 60% -). The copper and stainless steel components also improve efficiency. This pool heater comes with a lifetime warranty, so you don’t need to worry about repairs in case it breaks down. However, the warranty is valid for major parts only. Even though this pool heater is not best suited for large households, it is still a great purchase for anyone looking for an energy efficient electric pool heater. It is also space saving enabling pool owners to install it almost anywhere. 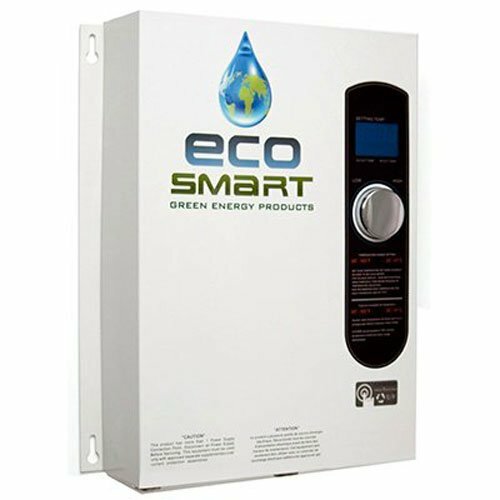 With a lifetime warranty and ETL Listed to UL 499 & CSA certification, the EcoSmart ECO 18 Electric Tankless Water Heater with Patented Self-Modulating Technology is a great bargain! The Hayward HP21104T HeatPro is another great, energy-efficient and durable electric pool heater. It has been manufactured by Hayward, a renowned manufacturer of environmentally friendly pool and spa equipment for both residential and commercial inground and above ground pools. The most notable features of this heater include the industry’s only Standard Ultra Gold corrosion resistant evaporator fin that improves durability and efficiency. It also offers low-noise operation making it ideal for domestic use. Here is a detailed review of the Hayward HP21104T HeatPro. 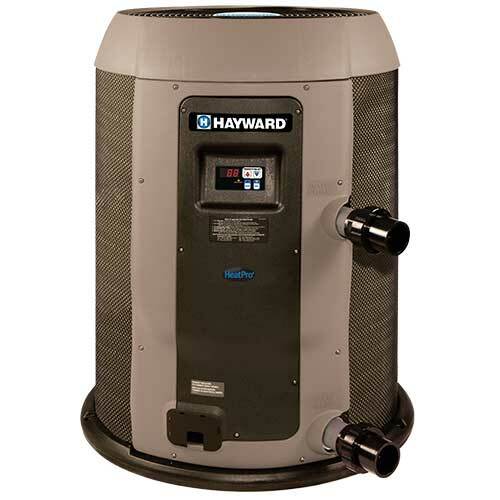 The size of a pool heater matters and that is why Hayward emphasized on a small pool heater that would easily be compatible with most households. It has been crafted from high-grade stainless steel material that is corrosion resistant. This heater features a simple, round design with a compact footprint for easy installation and compatibility with retrofit replacements. The design also features integrated hurricane tie-downs to meet the local codes without necessarily having accessory kits. The Hayward HeatPro sports a Titanium Heat Exchanger that guarantees the best performance even in unbearable conditions. This exchanger is pressure tested, highly energy efficient and impervious to corrosion. This makes the pool heater reliable and most importantly, durable. The Hayward HeatPro also comes with the Ultra Gold corrosion resistant coated evaporator coil fin that improves durability near coastal and other corrosive areas. The fan guard is also vinyl-coated to shield it from debris that may destroy it. Unlike most pool heaters out there, the Hayward HP21104T has a digital LED panel that displays the set temperature. The LED also shows the pool water temperature always. The temperature setting, on the other hand, is in 1-degree increments to guarantee accuracy. The heater also supports electronic frost control and temperature lock-out. One fantastic feature of this pool heater that sets it apart from the rest is the low-noise operation. It runs on a scroll compressor; the quietest compressor ever made. It has also been equipped with an acoustic compressor cover that ensures minimal sound is emitted to the environment. The profiled fan blade design also improves airflow thus reducing noise. If you are looking for efficiency and convenience, then the Hayward HP21104T HeatPro is the ultimate pool heater for you. It boasts of the best-in-class performance courtesy of the high-tech features it has been engineered with. The operation is also easy and convenient with the digital display. Even though installation is a little bit tricky, you will surely love its performance! The Hayward CSPAXI11 is a compact electric resistance water heater that has been specially designed for spas and small pools. This heater has a compact design to allow installation even when you are in limited space. It features a 304 stainless steel tank and threaded head which bolsters its efficiency. In this video, you can see all its major features. Here is the review of the Hayward CSPAXI11 11-Kilowatt Electric Spa Heater. Just like most Hayward pool heaters, the CSPAXI11 sports a unique, compact design that makes it easy to install almost anywhere. You can fix it under the spa or even on the steps. The design also makes servicing easier and gives full access to internal controls. 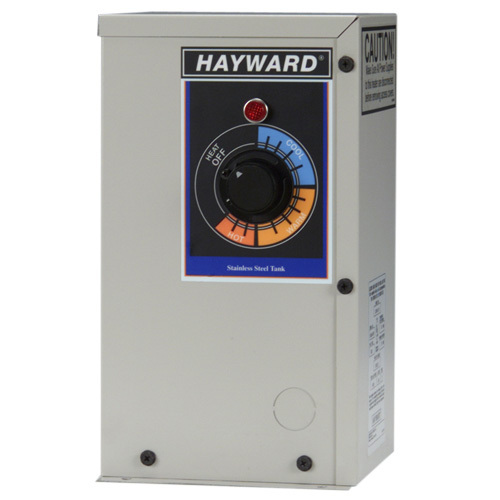 The Hayward CSPAXI11 11-Kilowatt Electric Spa Heater has a 304 stainless steel tank that is durable and efficient. It also has a 304 stainless steel threaded head which improves its working mechanism. When it comes to performance, the Hayward CSPAXI1 has a safety sensor electric heating element which has been optimized to heat water very fast using minimal energy. Rated at 11Kw, it heats water at a rate of approximately 5-degrees Fahrenheit per hour. So, depending on the water temperature, you can enjoy a warm spa or pool water in 4 – 6 hours. This spa heater is very user-friendly. It has been equipped with a simple dial on the front for temperature setting. There is also an ‘on’ indicator light for easy operation and monitoring. Even though it is specially meant to work with small pools and spas, the Hayward CSPAXI1 offers excellent performance. It has been built to last thus offering you years of exemplary service. It is easy to install and above all, easy to operate. If you love your spa or bath tub water warm, then this is your heater! Electric pool heaters are very efficient in heating pool water. Even though they may push your electricity bills to the limit, they are very reliable. Regardless of the season, you will get the best pool experience as they heat water to temperatures that you will love. So, if you are the type that wouldn’t do without swimming all year round, then you might just need an electric pool heater. Get any of the heaters above and brace up for the best pool experience even in the winter!